Thunder River Deer Creek loop has been on my bucket list for some time. 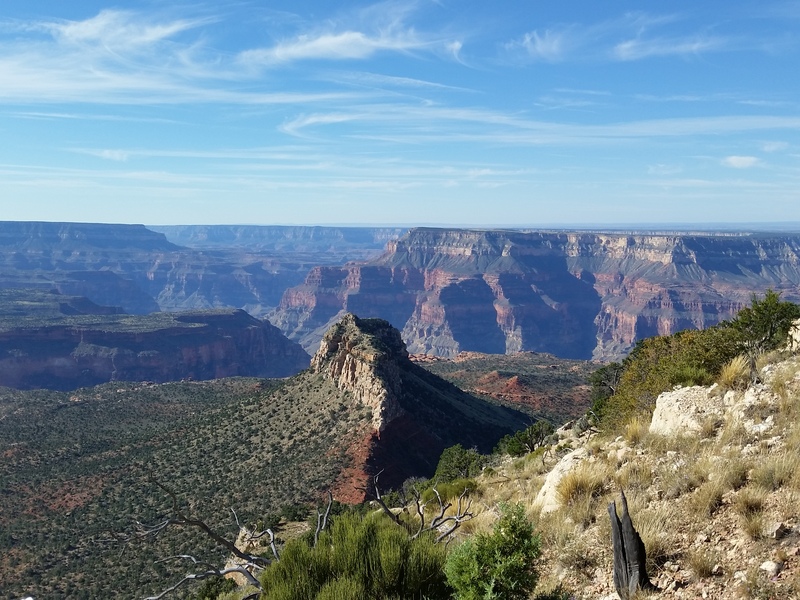 The trail is up on the North Rim far from the bustling tourist trap of the readily available amenities of the south rim and the groomed corridor trails. This trek is a little further out and with a hefty 7 hour drive commit from Phoenix, 20 mile dirt roads, and pure ruggedness of the trail (including some gnarly exposure) keeps most trekkers at bay. 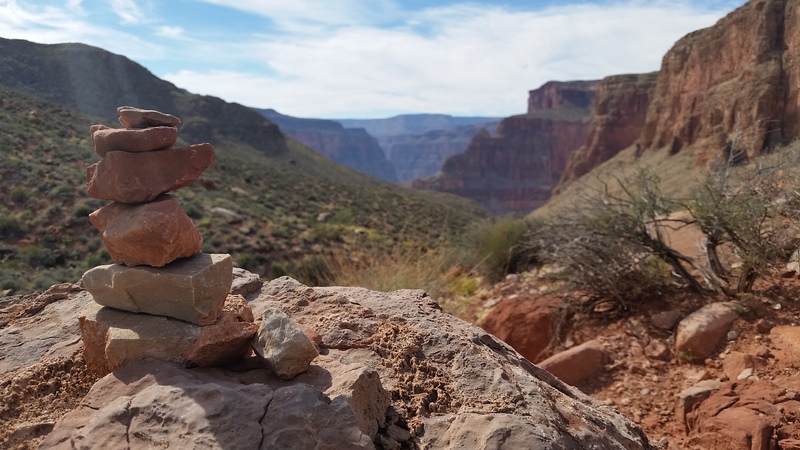 For my birthday weekend, Nicole and I drove up to the north rim from Phoenix on Friday in attempts to reach the trailhead, hike to the Colorado River and back in just 2 days. I wish I had another day in the canyon to do more sightseeing but from long drive time commit and diminishing vacation days left for the year it was all we could do to hit the river and back. 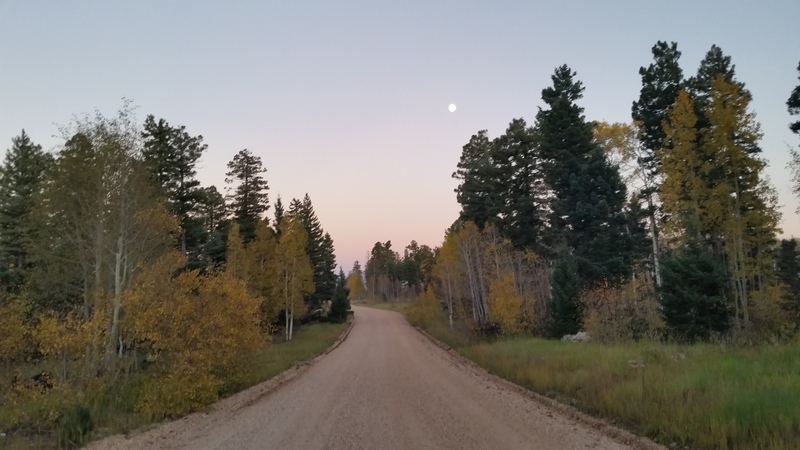 We headed for the North Kaibab Plateau from Phoenix, through the pines, the aspen, across the dirt roads, chasing the sun as it set towards the trailhead. The dirt road was surprisingly tame; the last 2 miles were not the case. The road suddenly became narrow, rocky, and steep. After some maneuvering across the roads and searching for a camping spot we found a nice spot right on the rim and set up shop. The next morning we woke and started getting our gear together, stuffing sleeping bags in stuff sacks, accounting for food and water, before strapping our packs on and walking the 0.5 mile road walk from our camp to Bill Hall trailhead. Bill Hall trail cuts some distance and time off the long trek, however at a price. 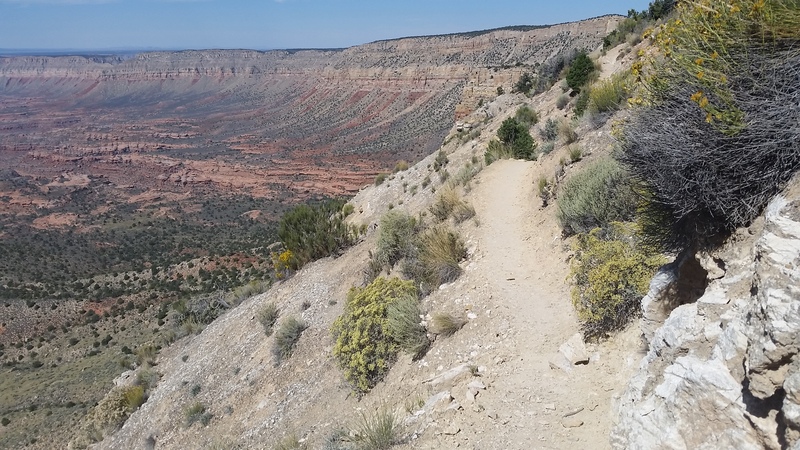 After leaving the trailhead, hiking up to Monument Point, we began the decent into the canyon. Nicole’s first glance at the exposed, rocky, loose trail spewed out an “I’m not going down that!” We drove a long way and I wasn’t ready to turn back and throw in the towel after only feet into the trail. I knew (even though she wasn’t too keen on exposure) she could take on the trail and conquer the exposure butterflies. We took it slow heading down the narrow trail with great care, making sure footing and the trail was good before traversing. Before we knew it we skirted the South side of the Monument Point and were descending the much safer switchbacks. We were soon on the flat Esplanade and trekking faster across the desert trail. With the help of some cairns and a GPS we made our way across the open desert the next switchback drop-off. 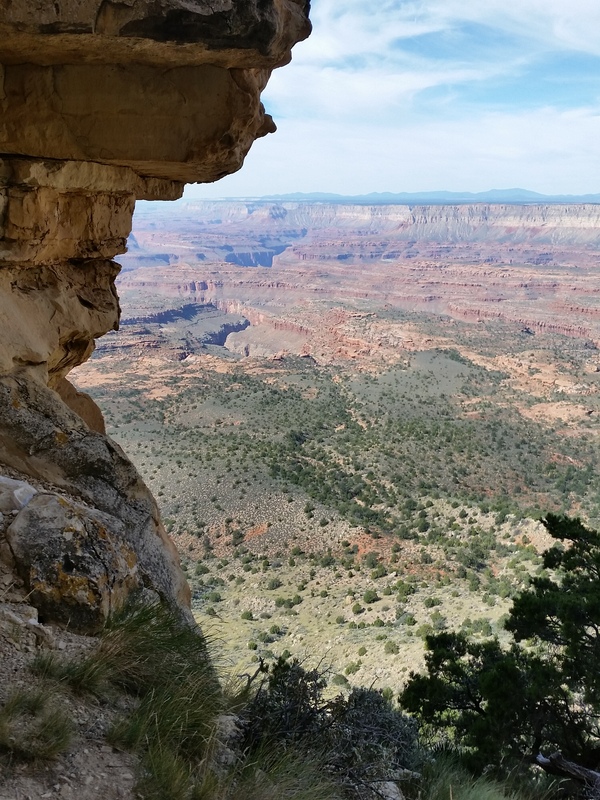 The trail was rocky but the views were gorgeous, looking into the vast canyon from a far we knew we had already covered some good ground but still had a long way to go before we reached camp and the scorching sun of the surprise valley was ahead. We dropped a 2 liter platypus under some rocks by the side of the trail in case we were low on water on our trek out. Then we bombed into the heat. We hit the Surprise Valley and as expected were met by a nice scorching sun. We were both hot, sweat drenched, tired, and ready for fresh water and a rest. Reaching the Deer Creek/Thunder river split we darted right towards the Deer Creek and hopefully the Colorado River, it was already 3pm and the trail only became less maintained and rocky jumping in and out of the wash that would eventually dump into the creek. This slowed us down and I started worrying about our diminishing water supply and quickly setting sun. I checked the topo map and saw that we had one last large drop before reaching camp at Deer Creek and the narrows we yearned to see; I only hoped there was no more exposure. Sure enough the last ¼ mile skirted a sheer rock face on a very narrow foot wide trail and the penalty for a mistake was a 300 foot drop to certain death. Let’s just say we took this section carefully down. After some rock kicking and nervous stepping we made it down the safer non exposed final switchbacks. As soon as we passed the exposed skirt section we both ran out of water. Luckily we entered what can only be described as a desert mirage. The lush green foliage that surrounded the creek was thick, green, and flourishing, even in the heat of the desert summer. The crisp cool water invited us with open arms and we quickly filtered and chugged down a few cool crisp liters. How replenishing, both to our parched lips and tired bodies. Following the creek down we soon reached camp and dropped our things knowing the sun would soon be setting. We met a couple, Katy and Mike, at camp. After a quick chat we found that we were going to be the only ones in camp being that Katy and Mike decided to hike up to the Esplanade to enjoy the full moon that night and advised us to head to the narrows before the sun set as making our way back could be tough in the dark. We thanked them and headed on down the creek. Soon the canyon began to transform, the lush green gave way to rising rock walls and the creek began to fall further and further below us in dripping waterfalls and snaking through the narrows. What an incredible sight, we finally reached what we came to see, and let me tell you; all the tired soreness from the day was lifted as we entered this incredibly special place. We stopped for a while, snapped pictures, took our shoes off and put our beat feet in the creek. I was happy to be here, in the bottom of the canyon, just the two of us in this special place. The sunlight continued to diminish and we decided to head back to camp. We quickly set up the tent, filtered water for the next day and made our mountain house dinners. I am sure to anyone we looked like savages, scarfing down our meals. We were in bed by 7:30 and were quickly crashed out. The next morning we woke at 3 am to beat the heat out, ate breakfast, packed up camp, and were quickly pushing up and out of the canyon in the dark with headlamps lighting the way. 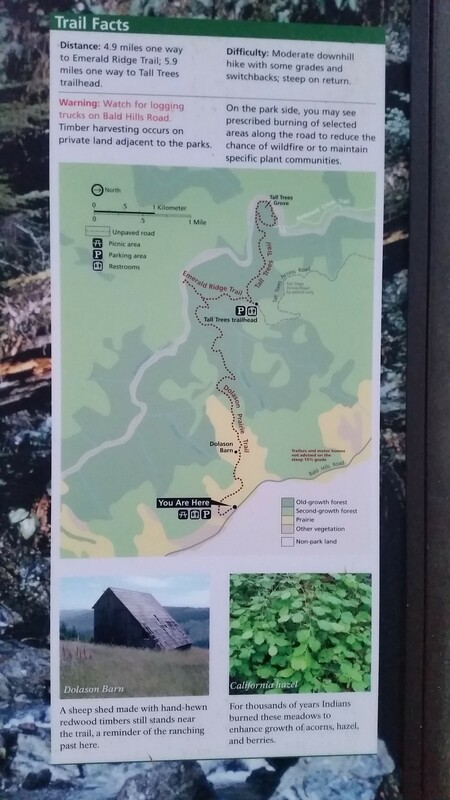 We hiked past the lush green riverside foliage, up the switchbacks, across the narrow skirt in into the trail to Surprise Valley before the sun even thought about getting up. 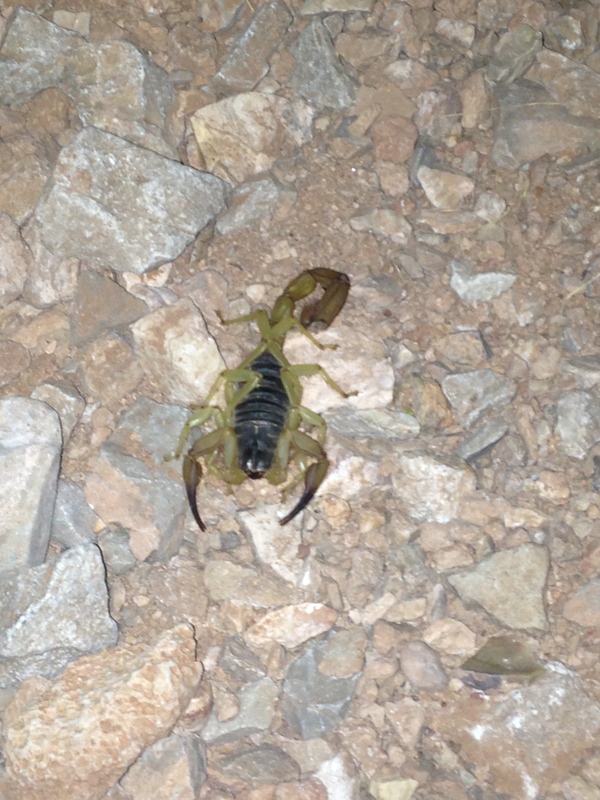 On the way out we saw a big scorpion in the middle of the trail, snapping a quick picture, we left him be and went back to our grind out of the canyon. On our way out we saw a few groups that we saw the day before. We continued to push up and out, up 5200 feet from camp to the trailhead. When we finally reached the top we were both happy we made it out without mishap. Another awesome trek completed, met new friends, and saw amazing new places; I love life on the trial! Esplanade, up up up we go!